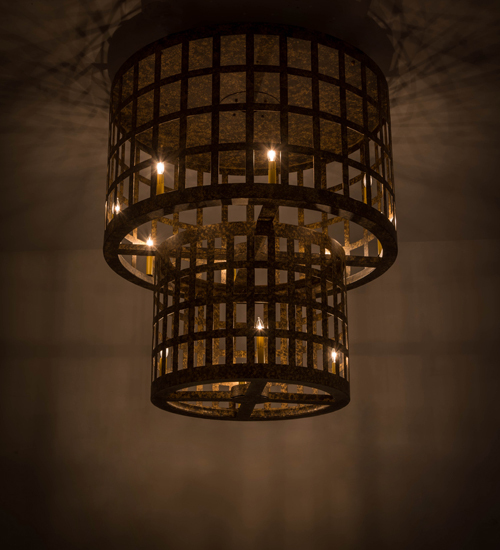 Description: Discover a unique decorative look and industrial lighting design featuring a Grand styled caged frame and exposed customer-supplied, faux candelabra lamping configurations displayed from within. Cilindro Golpe offers solid hardware and frame featured in a stunning Old Gold finish. The 40-inch wide fixture is ideal for illuminating entryways, lobbies and large residential and commercial spaces. Handcrafted by highly skilled artisans in the USA, this fixture is offered in a myriad of custom lamping options including LED, as well as sizes, designs and finishes. The fixture is UL and cUL listed for damp and dry locations.